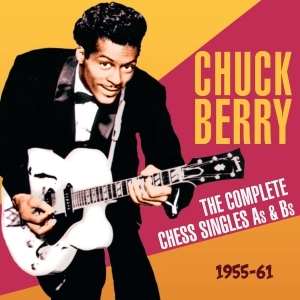 Chuck Berry was one of the key figures in the rock ‘n’ roll explosion of the mid-‘50s, as musical styles that had been part of R&B and country for a number of years came together in a cross-cultural hothouse fuelled by the power of mass media and the rebellious attitudes of the baby boom generation. So distinctive and individual are Chuck’s guitar technique and songwriting style that his hits from that era have become some of the touchstones which characterise the whole genre of rock ‘n’ roll. His trademark guitar intros and riffs, and songs like “Johnny B. Goode” and “Roll Over Beethoven” have become part of the universal language of rock ‘n’ roll to the extent that any group of reasonably competent musicians could perform a passable version of them without a rehearsal. Signed to the Chess label on Muddy Waters recommendation in 1955, he scored a million seller with his first hit “Maybellene”, and over the next few years recorded a string of classics, the songs articulating the experiences of teen life and the new consumerism in brilliantly observed lyrics as well as a musical style that combined the best of R&B and country. Even B sides like “Round And Round”, “Reeling And Rocking” and “Memphis Tennessee” have become classics which have been essential elements of many bands’ repertoire over the years. This great value 50-track 2-CD set comprises every A &B side released by Chuck during these phenomenal formative years, and it’s a must-have for every true fan of rock ‘n’ roll.